Events are presented below in parallel in order to give a better overview of what was happening onboad both vessel until the collision. SG stands for the bulk carrier SPRING GLORY and JM for the containership JOSEPHINE MAERSK. JM – On 25 May 2012, the container ship JOSEPHINE MÆRKS departed from Port Chalmers, New Zealand, for Tanjung Pelepas, Malaysia, via the Torres Strait. The ship was loaded with containers many of which were refrigerated containers with frozen meat. JM – In the evening of 5 June 2012, JOSEPHINE MAERSK was approaching the TSS in the eastern approaches to the Strait of Singapore from the east at a speed of 21 knots. SG – On 5 June 2012 at 0638 hours, the bulk carrier SPRING GLORY anchored at Eastern Bunkering B Anchorage, Singapore, waiting for bunkering, and at 1830 hours, after bunkering, the ship resumed her voyage for Qingdao, China, with the draft 13.88 m fore and 13.35 m aft. JM – At 1950 hours, the 3rd officer entered the bridge to prepare taking over as the officer of the watch. He checked everything relevant according to the change of watch check list and took over the watch at 2000 hours. One able seaman was on duty as a lookout as was normal practice. The radar range was set on 12 nm, north up, relative motion, off centre and trails. A few minutes later, the master came to the bridge and had a look at the traffic. Then, after a few minutes, he left the bridge. He told the officer of the watch to call him at a certain point near the eastern entrance to the TSS or whenever the traffic became very dense or the officer felt necessary. It was planned to take pilot for the arrival at Tanjung Pelepas on 6 June 2012 at approx. 0100 hours. JM – At 2035 hours, the course was changed from 311° to 284°. JM – At 2100 hours, the ship’s pos. was 01°17.1’ N – 105 °00.1’ E, the course was still 284°, and the officer of the watch noticed many fishing vessels ahead and on the starboard bow. At a point in time between 2100 and 2130 hours, the master was on the bridge to watch the situation and give his night orders to the officer of the watch. JM – At approx. 2130 hours, at pos. 01°19.47’ N – 104°50 .27’ E on course 284°, the officer of the watch noticed many ships ahead at anchor and also many fishing vessels on the starboard bow. There was a clearance of at least 0.5 nm between any other ship and JOSEPHINE MAERSK. He considered the clearance satisfactory since all ships were at anchor. The radar range was then set on 6 nm and thereafter briefly on 12 and 3 nm, still north up, relative motion and off centre as shown in figures 12 and 13 on the next page. JM – At approx. 2145 hours, the officer of the watch noticed that two ships were approaching on the starboard bow to enter the TSS and a third ship was following even further behind. All other ships, also on the port side, were obviously at anchor. He meant to plot all ships. His first concern and attention was ahead, on the ships at anchor to be passed and on the three ships approaching on the starboard bow. The officer of the watch maintained the speed and course of JOSEPHINE MAERSK in order to enter the TSS after the three ships approaching on the starboard bow and to follow and overtake them later on westward bound. He intended to call the master as per instruction before entering the TSS because the traffic and number of ships at anchor became dense. Also, if the clearance between JOSEPHINE MAERSK and any other ship became too close, he would call the master. The MAERSK officer of the watch did not notice any ships approaching on the port side, nor did the lookout who was standing at the centre of the bridge. The officer was focusing on the traffic on his starboard side and concentrated on a hard turn to port which he was about to make when entering the TSS. SG – At approx. 2200 SG – hours, the master left the bridge. The officer of the watch was the 3rd officer and an able seaman was on duty as a lookout both of whom were Chinese citizens speaking the mandarin language. The radar setting was 6 nm range head up, off centre and relative motion. The ARPA plot functions were not used, but trails were used. The radar had AIS overlay. JM – At 22:14:00 hours, while the radar was on 6 nm range, SPRING GLORY became visible on the radar at a distance of approx. 11 nm. SG – At 2216 hours, the radar range was 12 nm for about 15 seconds. JOSEPHINE MAERSK was then visible with a clear trail at a distance of approx. 10 nm on the starboard bow and crossing the course of SPRING GLORY. Thereafter and until the collision, JOSEPHINE MAERSK remained visible on the radar at a setting of 6 nm. As SPRING GLORY was approaching the eastern exit of the TSS, there was dense traffic transiting in both directions of the TSS, traffic from the east to be expected entering the TSS, several ships at anchor in the vicinity of the TSS, fishing vessels some of which sailing and some not, and good visibility. However, the view was disturbed by the lights from the many ships at anchor on the starboard side. JM – At 22:24:00 hours at 01°24.19’ N – 104°32.67’ E, while SPRING GLORY was still visible on the radar at a distance of approx. 5 nm, it could be identified on AIS. SG – At 22:24:04 hours, at a distance of approx. 5 nm, JOSEPHINE MAERSK was selected as a target on the radar and identified with expanded data on the AIS. The bearing on JOSEPHINE MAERSK had not changed. On the port bow SPRING GLORY had several oncoming ships and on the starboard bow apart from JOSEPHINE MAERSK a few oncoming vessels, probably fishing vessels, and several ships at anchor as shown in figure 6 below. SG – A few minutes later, at 22:26:00 hours, JOSEPHINE MAERSK’s closest point of approach (CPA) was indicated as 0.03 nm and the time to the closest point of approach (TCPA) was indicated as 8:59 minutes on the radar of SPRING GLORY. SPRING GLORY maintained its course and speed. JM – The situation on the bridge appeared normal until suddenly at 2229 hours when the officer of the watch observed a green light on the port side bow at a distance of 2 nm or a little more. He went to the port side bridge wing and observed through the binocular the green light and went back to the radar in the wheelhouse, placed the curser on the ship in question and found that the distance between the ships was approx. 2 nm. Then he checked his own position on the GPS and plotted it into the chart. The officer of the watch had not observed the other ship on the radar prior to his visual observation of the ship, nor had the able seaman who was on duty as a lookout. SG – At 22:30:53 hours, at a distance of approx. 2 nm, the officer of the watch on SPRING GLORY called JOSEPHINE MAERSK on VHF channel 16 without receiving any reply. JM – Then, at 22:30:54 hours, as soon as the officer had plotted his position into the chart, the ship on the port bow that was SPRING GLORY called JOSEPHINE MAERSK on the VHF channel. He responded to this call on channel 16 and it was agreed at 22:31:20 to change to channel 15. The communication on VHF was not effective. SG – At 22:31:17 hours, at a distance of approx. 1.5 nm, the officer of the watch on SPRING GLORY repeated his call which was then answered by the officer of the watch on JOSEPHINE MAERSK, and it was agreed to continue the communication on channel 15. The communication between SPRING GLORY and JOSEPHINE MÆRSK was loud and clear on VHF channel 15; however, it was sometimes disturbed by noise and communication between two other ships, one of which was an Indonesian warship. SG – At 22:31:44 hours, the officer of the watch on SPRING GLORY asked how JOSEPHINE MAERSK intended to pass SPRING GLORY. The officer of the watch on JOSEPHINE MAERSK asked to repeat the question and a few seconds later he also asked about the name of the ship (SPRING GLORY). SG – At 22:31:54 hours, the officer of the watch on SPRING GLORY repeated his question about JOSEPHINE MAERSK’s intended passage; however, without receiving any response. SG – At 22:32:29 – 22:32:36 hours, the officer of the watch on SPRING GLORY repeatedly called and once whistled in the VHF to attract the attention of JOSEPHINE MAERSK asking how the call was read in JOSEPHINE MAERSK, but he received no response. SPRING GLORY and JOSEPHINE MAERSK maintained its course and speed. JM – At 22:32:47, the officer of the watch understood that was advised to increase the speed of JOSEPHINE MAERSK and to pass SPRING GLORY in a way that he did not understand clearly. However, he immediately knew it would be quite impossible to increase the speed in due time, so he did not reply because he saw the other ship coming close very fast and therefore he called the master asking for help. JM – At 22:33:10 the officer of the watch altered the course giving full starboard helm by manual steering. When the master was called for, he got up from his couch, looked at his watch and saw that it was about 2230 hours. He therefore believed that he was called for because the ship was about to enter the TSS. However, he felt that the ship initiated a hard starboard turn immediately after, so he knew that something was wrong and hurried to the bridge. SG – At 22:33:21 hours, the officer of the watch repeated his call to JOSEPHINE MAERSK asking about that ship’s intention – still without receiving any response. SG – At 22:34:00 hours, at the heading 50° and speed 11. 2 knots and a very short distance to JOSEPHINE MAERSK, SPRING GLORY initiated a hard turn to port. JM – When the master arrived on the bridge at 22:34:30 hours, JOSEPHINE MAERSK was still in a hard turn to starboard and SPRING GLORY was very close to the port side. JM – At 22:34:40 hours, the starboard side of SPRING GLORY hit into JOSEPHINE MAERSK ’s port side and a few seconds later into the port side quarter. The master took over the watch, reduced the speed to half ahead, slow ahead and then stopped the engine. SG – At 22:34:40 hours, SPRING GLORY’s starboard side collided at a speed of 11 knots, a heading of 44° and a course over the ground of 55° with the port side of JOSEPHINE MAERSK at a collision angle of about 40° on pos. 01°25.28N – 104°29.20E. 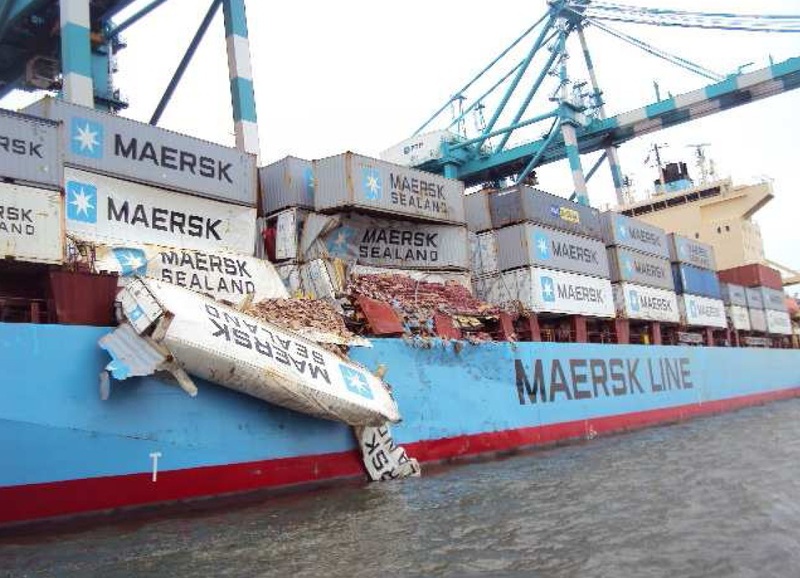 As JOSEPHINE MAERSK was carrying out a starboard turn at that time, this ship was also hit at the port quarter before both ships departed from each other. JM – Then at 22:34:55, he gave the order to raise the general alarm and informed the crew on the public address system that there had been a collision. JOSEPHINE MAERSK began drifting, the chief officer arranged for the first brief inspection on deck and returned quickly to the bridge and informed the master about his immediate impression of the damage. And the chief engineer did likewise in the engine room. The master initiated the “collision plan” according to the ship’s emergency response plans, and after 5-10 minutes’ drifting, he manoeuvred dead slow ahead to ensure steering. The master made his first and immediate contact to the owners to immediately inform them that there had been a collision. Meanwhile, the 3rd officer attempted to get in contact with the VTIS Singapore; however, in vain. The master observed on the AIS that SPRING GLORY continued her voyage and called the ship on VHF to ascertain the situation on that ship. It was confirmed that SPRING GLORY had no leakage or in other way was in a distress situation. While talking with SPRING GLORY, the master observed flickering lights, probably from a fire. He therefore told SPRING GLORY that he had to break off. This, however, prompted no reaction from SPRING GLORY, neither as regards the safety of JOSEPHINE MAERSK nor as regards the possible need for assistance. The master told the chief officer via VHF that a fire had broken out. He sounded the fire alarm and instructed the chief officer to let the crew muster according to the fire muster list. It was briefly stated that there was no dangerous cargo in the ship, and that the fire was on the electrical installations of the refrigeration machinery of some containers. The electric power supply for the refrigerated containers and ventilation was switched off. A fire-fighting operation was commenced under the leadership of the chief officer. 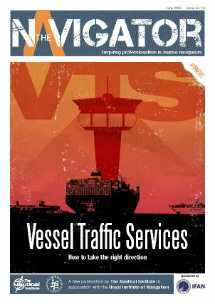 And the VTIS Singapore Strait was informed about the collision and the situation. During the fire-fighting, only water was used and all electric power supply was disconnected. Fire-fighters dressed with firefighting equipment and air breathing apparatuses were ready, but they were not in action because there was no need. Meanwhile, the master managed to get in contact with the VTIS East informing about the situation, that the crew and the ship ship were in no immediate danger and that there was no imminent pollution threat to the environment. Furthermore, he contacted the owners again for an update on the situation. SG – Immediately after the collision, the master arrived on the bridge and took over the watch. SPRING GLORY continued the turn to port until 22:36:15 whereafter, at a heading of 351°, it turned to starboard until 22:40:55. Emergency response and dispositions on SPRING GLORY After the collision, the general alarm was activated at once, and the master ordered the crew to check the bilges, tanks, etc. for any flooding, structural failure or oil pollution. Meanwhile, the master ordered other crew to wait at the muster station. Later, it was reported that no oil spill or water ingress was found. The starboard side of the collision bulkhead was slightly deformed and there was a crack 4-5 metres above the waterline. The master decided to anchor at a position approx. 10 nm east of the collision site and ordered the duty officer and able seaman to patrol the entire ship and observe two containers that had fallen from JOSEPHINE MAERSK onto the forecastle. In case of any problems were identified, the duty seaman should call the master at once. JM – At 2308 hours, the ship’s voyage data recorder (VDR) was set to backup. JM – At approximately 2330, the fire in the refrigerated containers was extinguished. Simultaneously with the fire-fighting process, the tanks and bilges were sounded and observations were constantly made for any ingress of sea water or any oil leakage from the ship. No ingress or leakage was observed at any time. It was clear that a few containers, probably four, had been lost over board into the sea and that a few ones had fallen onto the deck of SPRING GLORY. JM – After midnight, on 6 June 2012 at approx. 0120, JOSEPHINE MAERSK commenced her voyage for Tanjung Pelepas after having provided due information about the situation, including an estimate of the number of containers lost overboard, to the VTIS Singapore Strait and to the owners. During the resumed voyage for Tanjung Pelepas, the master and the chief officer achieved a more detailed overview of the damage to the ship and cargo as far it was possible due to darkness, etc. SG – On 6 and 7 June 2012, the crew temporarily repaired the damages and lashed the two containers. The master then decided to proceed to the discharge port after having made a risk assessment. 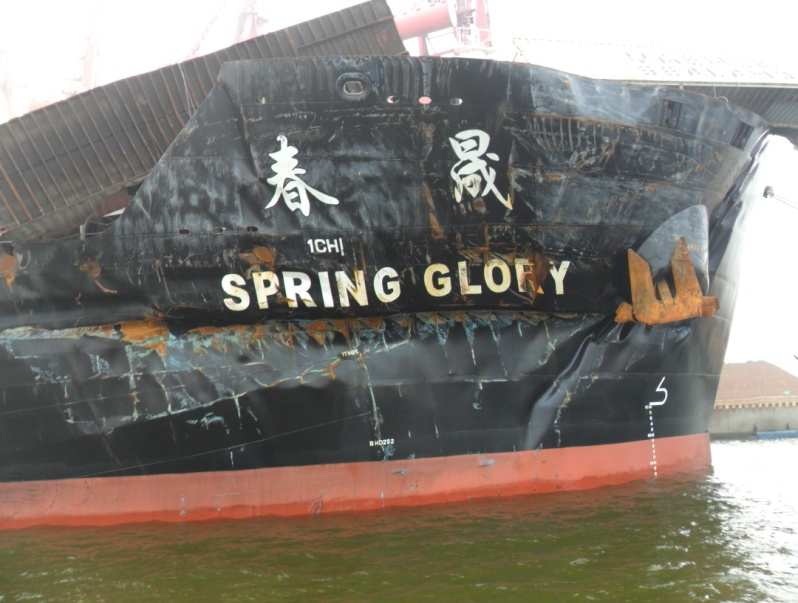 SG – On 7 June at 1616 hours, SPRING GLORY resumed its voyage. No one was injured, and there was no pollution of the environment. The shell plating located on the starboard bow, topside tank and internal structures and affiliated equipments and combination ladders, etc. sustained contact damage. The starboard side frames, beams, hull and deck of the forecastle, bosun-store on the main deck of the fore part of no.1 hatch were slightly deformed and dented from frame no. 263 to no. 241 and about 4 metres above the waterline. The starboard anchor and chain pipe were deformed. The starboard side of the collision bulkhead was slightly deformed. The frames and hull were slightly deformed and dented from frame no.116 to no.119 and about 5 metres above the waterline to deck. The starboard side pilot combination ladder was deformed. A hole was made in the void tank starboard side and 5 metres above the waterline, size about 1.4 x 0.5 metres. Three holes were made in the starboard side of no.1 TWB.TK(S), all about 5 metres above the waterline, size about 0.1 x 0.05 metres (frames nos. 248 to 249), 0.2 x 0.1 metres (frames nos. 248 to 247), 0.3 x 0.5 metres (frames nos. 241 to 242). Photos of some of the damage to SPRING GLORY are shown below. No one was injured, and there was no pollution of the environment. There was extensive damage around bays 16 and 20 with damage to several containers and loss of six containers, two of which landed on the forecastle of SPRING GLORY, indentation of the ship’s side and hatch coamings and damage to hatch covers and indentation of the ship’s side on the port quarter. The majority of the damaged containers contained frozen meet which soon began to rot and decompose after having been exposed to the ambient temperature. 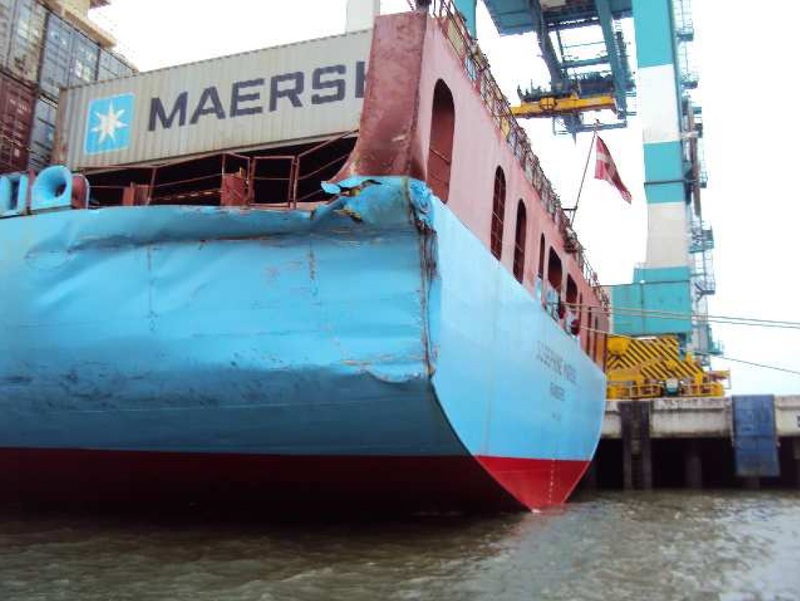 Photos of some of the damage to JOSEPHINE MAERSK are shown below. Prior to the collision the two ships were in a crossing situation with SPRING GLORY as the “giveway ship” and JOSEPHINE MÆRSK as the “stand-on ship”. As the bridge team on JOSEPHINE MAERSK had not observed SPRING GLORY, they did not acknowledge that their course and speed would lead to close quarters with SPRING GLORY until very late. Though actions thereafter were basic tasks to be performed in a normal situation, valuable time was lost and thus attempt to avoid a collision came too late. On JOSEPHINE MAERSK this condition was caused by the officer’s focus on the crossing traffic from the starboard side, the pre-occupation with the ships at anchor and the forthcoming altering of the course. Furthermore, the radar did not offer the officer of the watch the necessary overview of the situation and the role of the lookout was not integrated as an effective part of the bridge team. When the officer of the watch acknowledged the impending situation, he did what he was trained to do; namely setting own ships position in the paper chart and identifying the other ship on the AIS and thereby delayed manoeuvring the ship to avoid the collision. On SPRING GLORY the officer of the watch acknowledged the presence of JOSEPHINE MAERSK in due time. He was hesitant to take action because he believed that the situation would develop more favourably and thereby be solved. This belief was based on the difficult traffic situation he had and because he believed the situation would turn out more favourable, i.e. JOSEPHINE MÆRSK would alter its course and thus solve the situation. Therefore, he realized the graveness of the situation too late and thus his attempts to avoid a collision came too late. On SPRING GLORY the officer of the watch tried to clarify the intentions of JOSEPHINE MAERSK by repeatedly calling the ship on VHF. These attempts were not successful and valuable time was spent attempting to establish contact and it created confusion in the other party, namely the officer of the watch on JOSEPHINE MÆRSK. This is a good example of the risk involved in using and relying on VHF communication as the basis for one’s decisions. On both ships the officer of the watch was the 3rd officer and probably the least experienced of the ship’s officers. Experience is required to recognize one’s human limitations and acknowledge one’s own problems regarding manoeuvres and expected actions by another ship, and though qualified to be responsible for the watch, the dispositions of the officers of the watch in both ships indicate that they needed assistance at an earlier stage. Neither of the officers called the master because the situation in both ships appeared normal until it was actually too late. There is no indication that the lookout in neither of the ships played an active role or was considered a resource for the navigation and bridge watch prior to the collision. On JOSEPHINE MAERSK this may have contributed to the situation that SPRING GLORY was observed very late. More training for crew about seaman’s skills and revise the relative SMS regarding safe navigation. The ashore managers also will inspect and check the seaman’s skills when they visit the ship. The captain shall train the officers regularly about the COLREG and ship manoeuvrability. The captain must be on the bridge when the ship navigates in restricted visibility, confined water, inland waters, high density traffic, complicated current or weather situation. The company shall check up the officer’s all certificate and abilities before employed. During night, captain shall random check the working condition of OOW and write the night orders which contain the attentions of night navigation before sleeping. The captain shall evaluate officer’s ability regularly and train for their shortage and or weakness both ability and sense of responsibility. 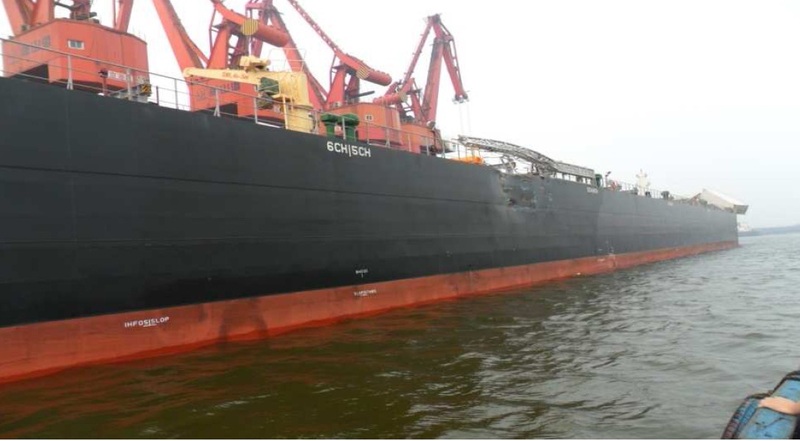 The shipping company has prepared a Technical Flash, elaborating the already existing procedures.